Gurjit Holiat is responsible for database management, accounts payable and office administration. 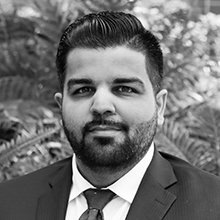 Gurjit has over five years of experience in accounting and finance. Prior to joining RMA, Gurjit held multiple accounting positions with an industry-leading investment bank. As a senior accountant, he led a team of six individuals in servicing a major California state employee pension system. Gurjit also provided customized reporting and cash forecasts for clients. Gurjit holds a B.S. in accounting with a minor in international business from the University of Phoenix. He is a member of the Accounting Society, which provides guidance and opportunities for accounting majors at California State University Sacramento.